For some reason, being that I am only 4'11" and always the tiniest in my classes growing up, I assumed my own children would be on the smaller side or end up down the middle between me and Ben who is around 6'. Little did I expect Aria to be in the 90's+ percentile in length for nearly every checkup since birth! On top of that she's been bursting with new words and complex concepts every day, which blows my mind completely. Suffice it to say, the experience of raising a child has been so much more about feeding her, as well as keeping up with the incessant growth spurts that I never expected. To give a little bit of backstory, I breastfed Aria for 12.5 months. My goal was to hit 1 year which I'm proud to say I did, but I also look at it for what it is—a beautiful and sacrificial journey. In case you missed it, I spoke more in depth about my experience breastfeeding in this video. Breastfeeding on the beach nearly 1 year ago. I'm still amazed this was possible! Babies grow SO rapidly in the first year so it's a critical time for nutrition especially in supporting the brain. In fact, babies brain size grows 175% in those first twelve months. * While I still plan on breastfeeding baby #2, I’m so thankful that formulas have come a long way in bridging the gap between the two options. There is a huge middle ground for being able to incorporate one or the other—or even both—knowing at the end of the day, fed truly is best. One ingredient in particular, which is just starting to be added to certain formulas is called MFGM or Milk Fat Globule Membrane. MFGM naturally occurs in breastmilk and has important components that support brain development and the immune system. 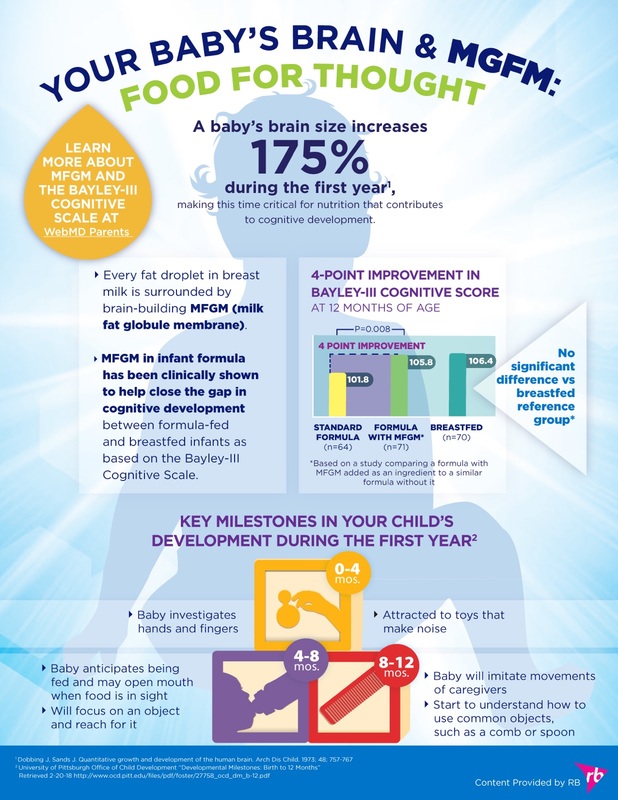 In fact, adding MFGM to formula is clinically shown to help close the gap in cognitive development between formula and breast-fed infants. It's basically formula's biggest innovation since the introduction of DHA, which is huge. After years of research, more formulas that have MFGM will be popping up in the market, supporting babies as they reach those critical milestones. You can read more info on MFGM on WebMD here and in the infographic below. Finally enough hair to give her a matching mini-bun! I know that for this kid, I will personally be stocking up on an MFGM formula, especially to supplement those early days before my milk kicks in to give this baby the best chance of growth and development just like his older sister had! Mamas, I would love to hear how you fed your kids. Was it different between subsequent children? Let me know in the comments and any tips you have!